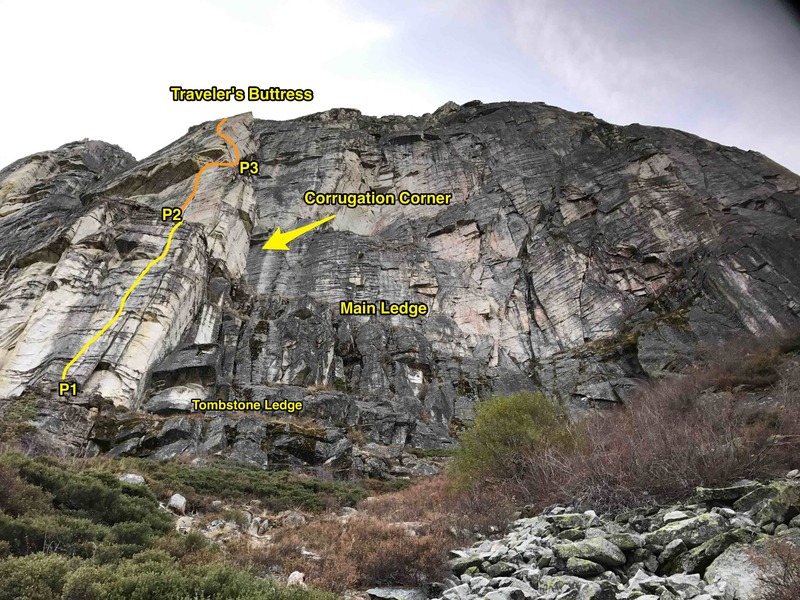 My climber partner and I arrived at 9am to Traveler’s Buttress, a 5.9 ⭐️⭐️⭐️⭐️⭐️ 600 ft climb featuring awesome hand cracks and a difficult off-width. Pitch one is a really good five star classic climb. The first mantel move is beautiful and really sets the tone for the rest of the pitch. Solid flow around hand jams and even the ‘awkward 5.8 jams’ were interesting problems despite the ‘awkward’ part. Pitch two starts form the main ledge just left of Corrugation Corner. The epic, smooth, footless 5.9 off-width section starts just 15 above belay. It’s a rightward facing offwidth so I highly recommend slinging your right racked gear over your left shoulder so you can fit inside the crack. I struggled for 30-40 minutes in this off-width. 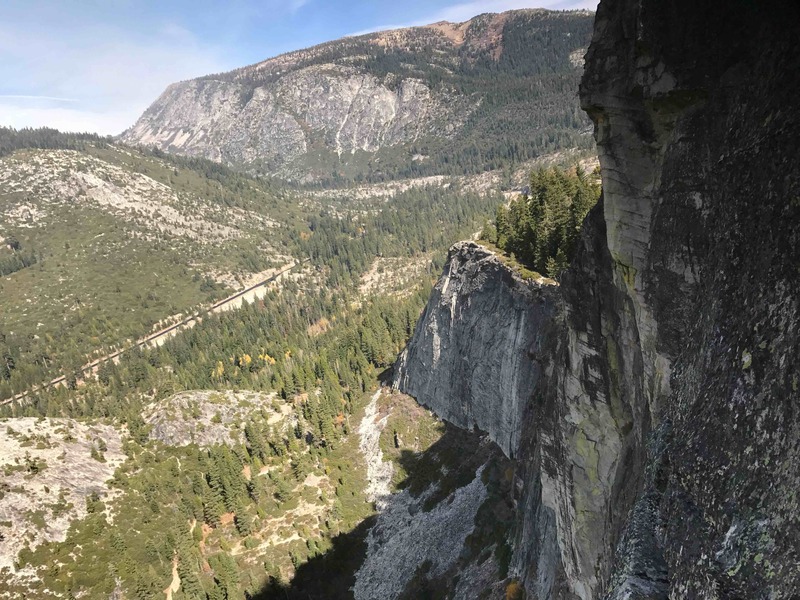 Once at the base of it I pushed to gain a solid left hand / wrist jam high above my head in a ‘v’ of rock joining the left crack wall and a slanted hold. Using this solid jam I placed a #4 cam up high just under this hold and worked repeatedly to jam / lock / cam my feet or calves into the featureless rock below to advance upward. Fall after fall was caught on this left wrist jam as I would advance my feet up only to have them slip. If I didn’t help catch these falls with my feet it meant my entire weight would abruptly yank down solely on my left wrist jammed in the crack. Next my arm would straighten on the fall and cascade this massive force into contact between the wall and my left tricep. The rock attempting to bend my arm opposite the elbow. After a couple of these good falls I started worrying I was going to break my arm and attempted to take my left wrist jam out to rest on my high #4 cam… it was stuck. Freeing this left hand jam high above my head required advancing upward to unweight it so I could pull it out. These were the same movements I was trying to rest to complete. My right hand was now too weak to alone pull me up higher after so much time above my head. As a result, my falls became harder, applying sharper force on my stuck wrist and deep pain in my arm as it would hit the wall and try to bend back. Each fall would cause me to exert louder noises of something between a scream and a whimper from the pain and increasing panic. The recent story of the climber who lost his stuck finger in a crack after a lead fall was on my mind. Reenactment of what the wrist jam kinda looked like. 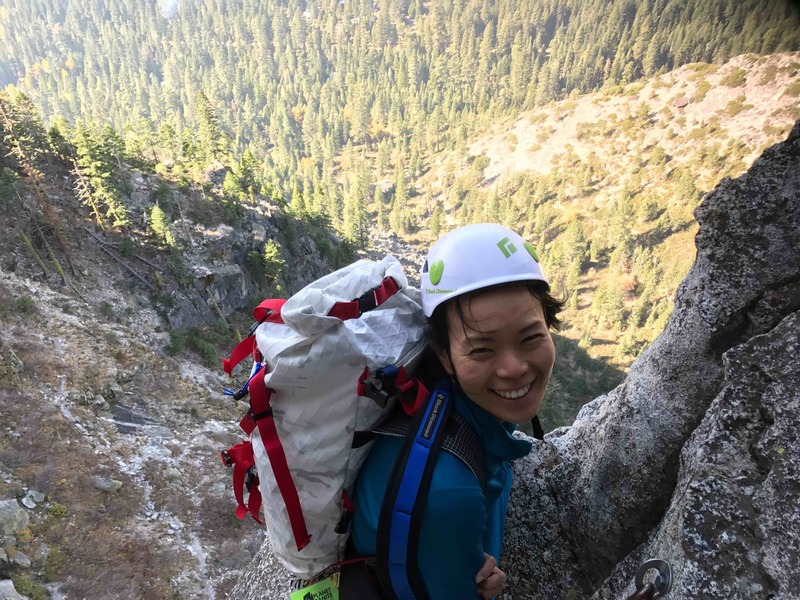 Belayer rescue was probably not possible and 911 was likely over an hour of painful hanging away. I was on my own in this situation…just me, my body and my technique. After what felt like 10 minutes of frantic struggle I was finally able to cam my foot enough to gain the elevation to free my hand. I hung on my #4 and slung my arms down in exhaustion, letting the blood return to my extremities. Despite the slight inflammation and deep bluish depressions, my wrist was surprisingly healthy upon rotating and inspecting it. I took at least 5 minutes to rest and get my head right before giving the crack another shot. I refused to give up, boldly placed a now right hand into the same spot that had just stuck my left hand while caming my foot. After a few attempts I was up and past this crux. I had done it. Coming down from the adrenaline, I had a hard time enjoying the rest of the pitch filled with interesting hand jams. Crossing the over the arete, I reached the small ledge for belay of my follow who now had to edge their way up through the offwidth. After 30 minutes of valiant effort I had to set up a 3-1 system to pull her up through the crux. 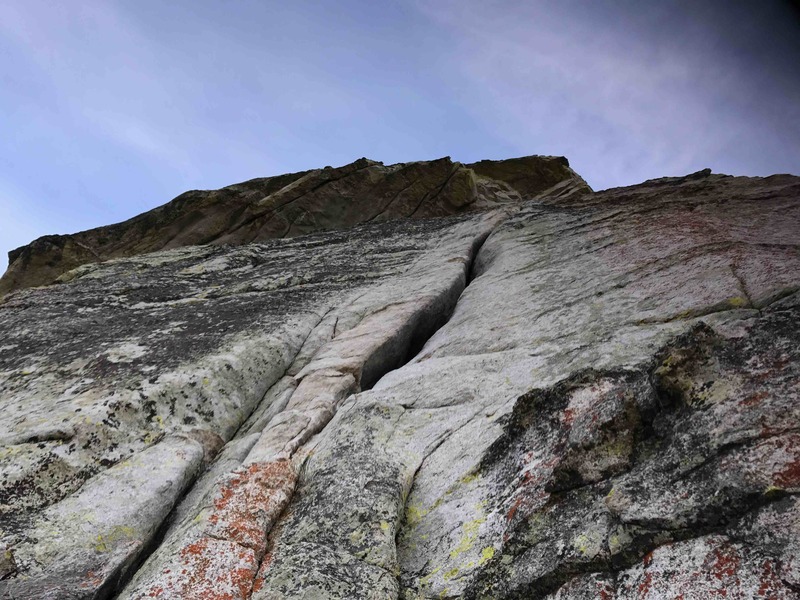 When my exhausted follower appeared around the arete I felt my entire body take a deep sigh of relief as we hugged in celebration of overcoming the off-width. Pitch two alone had just taken two hours in all this commotion, but we still had 300 feet of climbing left. Pitch three brought me up a fun crack to an enjoyable and heady 5.8 with wild exposure. Route finding was difficult as I crossed the arete to a sheer vertical face with whipping wind and delicate, balancey dikes. I set up belay in a horizontal crack just above a larger six inch crack I used as a ledge. There is a true ledge 15 feet higher but it’s a stretch for a 60m rope. I’m unsure which is the ledge super topo mentioned. Our last pitch was a sprint up some 5.fun dikes to finish. 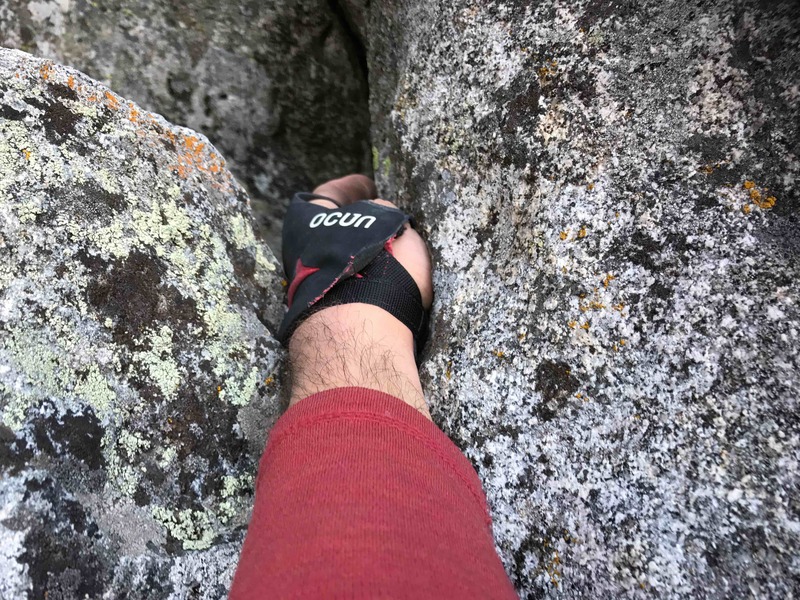 I could have done a lot of things after freeing my stuck hand… I could have freaked out, given up, refused to use that essential hold, avoided hand jams or called the weekend off. I’m most proud of myself for doing none of those things, but focusing on solving the problem and finishing the climb. A worst case accident like this at Lover’s Leap actually has a lot of options. It is right off the highway, close to civilization. 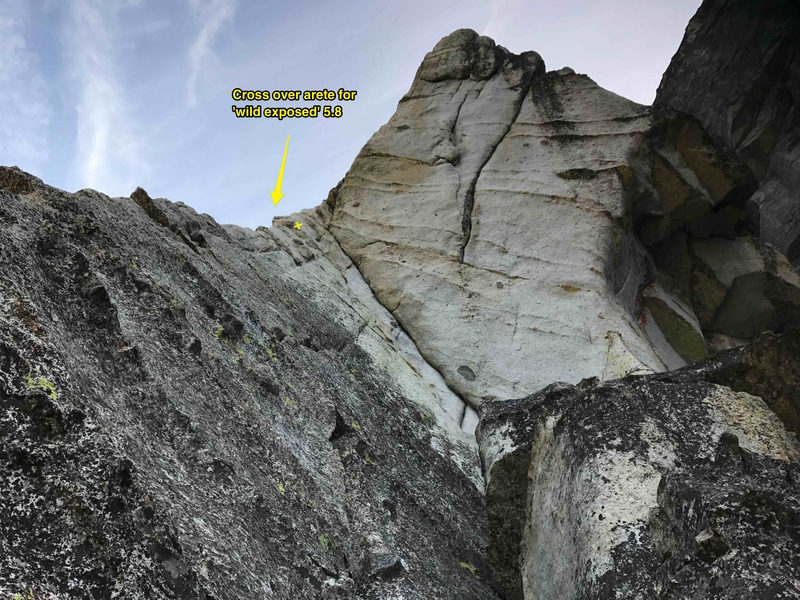 The crux was only 15 feet from a belay ledge for belay rescue. However, in the future when I’m climbing multiple hours from a road, hundreds of feet up a long multi pitch alpine climb I won’t have these benefits. Mental fortitude is everything and I weathered the storm.